Michele Bachmann, a three-term member of House of Representatives from Minnesota, is closely associated with the Tea Party movement and right-wing social activism. She founded the Tea Party Caucus in the House, and her most fervent supporters tend to be right-wing conservatives. In May 2013, she announced her decision to retire from Congress and did not seek reelection in the 2014 midterm elections. The accusations led to relatively small but boisterous protests in Egypt against Secretary Clinton, whose motorcade during a visit in July 2012 was pelted with fruit and debris. The New York Times reported that the protesters—many of them citing the claims of Bachmann and other conservative U.S. figures—apparently believed that the United States had helped elect the Muslim Brotherhood in Egypt. The U.S. embassy strenuously denied the claims, however, and one Muslim Brotherhood operative quipped that the “Muslim Brotherhood can’t even penetrate the Egyptian government,” let alone the U.S. government. Despite her hawkish tendencies, Bachmann opposed the Obama administration’s intervention in Libya, calling it in April 2011 “foolish” and adding, “The only reports that we have say that there are elements of al Qaeda in North Africa and Hezbollah in the opposition forces.” On May 1 she made an egregious error, telling Fox News Chris Wallace, “He [Obama] said he wanted to go in for humanitarian purposes and overnight we are hearing that potentially 10 to 30,000 people could have been killed in the strike.” She was in fact referring to U.S. Ambassador to Libya Gene Cretz’s assertion that 10,000-30,000 Libyans had been killed in the fighting between anti-Qaddafi rebels and Libyan forces. Bachmann rode the Tea Party’s momentum to stardom during the 2010 electoral cycle, and infamously gave the “Tea Party Response” to President Obama’s 2011 State of the Union Address. Prior to serving in the House, Bachmann was a member of the Minnesota Senate. She was a tax lawyer before entering public life. Brian Bakst, “Rep. 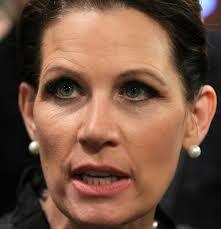 Michelle Bachmann Says She Won’t Run for Re-Election,” ABC, May 29, 2013, http://6abc.com/archive/9119569/. Eli Clifton, “Bachmann: Muslim Brotherhood Has ‘Penetrated’ The U.S. Government,” Think Progress, June 22, 2012,http://thinkprogress.org/security/2012/06/22/504937/bachmann-muslim-brotherhood-penetration/. Robert Dreyfuss, “Michele Bachmann’s McCarthyite Witch Hunt Against Muslims, ‘Sharia Law,’” The Nation, July 23, 2012, http://www.thenation.com/blog/169001/michele-bachmanns-mccarthyite-witchhunt-against-muslims-sharia-law#. Ben Armbruster, “House Intel Committee Members Speak Out Against Bachmann’s Anti-Muslim Allegations,” Think Progress, July 25, 2012,http://thinkprogress.org/security/2012/07/25/583201/house-intel-committee-bachmann/. Igor Volsky, “Boehner Blasts Bachmann, Says Her Unfounded Accusations Are ‘Pretty Dangerous,’” Think Progress, July 19, 2012,http://thinkprogress.org/politics/2012/07/19/548671/boehner-blasts-bachmann-says-her-unfounded-accusations-are-pretty-dangerous/. Ben Armbruster, “Romney Adviser Bolton Backs Bachmann’s Anti-Muslim Witch Hunt,” Think Progress, July 24, 2012,http://thinkprogress.org/security/2012/07/24/579621/bolton-bachmann-muslim-brotherhood/. Igor Volsky, “Gingrich Defends Bachmann’s Attack On Top Clinton Aide,” Think Progress, July 24, 2012,http://thinkprogress.org/security/2012/07/24/572601/gingrich-defends-bachmanns-attack-on-top-clinton-aide/. Robert Mackey, “Behind Jeers for Clinton in Egypt, a Conspiracy Theory With U.S. Rootsm” New York Times, July 16, 2012,http://thelede.blogs.nytimes.com/2012/07/16/egyptians-who-jeered-clinton-cite-american-conservatives-to-argue-u-s-secretly-supports-islamists/. Jane C. Timm, “Amid call for religious freedom, Values Voter speakers slam Islam,” MSNBC, September 26, 2014, http://www.msnbc.com/msnbc/amid-call-religious-freedom-values-voter-speakers-slam-islam. Jeff Zeleny, “Bachmann Is In, Officially,” New York Times “The Caucus,” June 27, 2011,http://thecaucus.blogs.nytimes.com/2011/06/27/bachmann-is-in-officially/. MicheleBachmann.com, “Tell Obama: You’ve Betrayed Israel,” http://www.michelebachmann.com/israel/. Pamela Geller, “Michele Bachmann on Israel,” Atlas Shrugs, June 23, 2011, http://atlasshrugs2000.typepad.com/atlas_shrugs/2011/06/michele-bachmann-on-israel.html. Andy Birkey, “Bachmann: America ‘cursed’ by God ‘if we reject Israel,’” The Minnesota Independent, February 8, 2010,http://minnesotaindependent.com/55061/bachmann-america-cursed-by-god-if-we-reject-israel. Jeffrey Goldberg, “Michele Bachmann’s Hazardous Love for Israel,” Bloomberg News, July 18, 2011, http://www.bloomberg.com/news/2011-07-18/michele-bachmann-s-hazardous-love-for-israel-jeffrey-goldberg.html. Seema Mehta, “Michele Bachmann’s misstatements may be catching up to her,” Los Angeles Times, October 23, 2011,http://www.latimes.com/news/nationworld/nation/la-na-bachmann-20111024,0,847441.story. Andy Birkey, “Bachmann on Iran: U.S. needs to do more than talk,” The Minnesota Independent, November 18, 2010,http://minnesotaindependent.com/74387/bachmann-on-iran-u-s-needs-to-do-more-than-talk. Peter Hamby, “Bachmann assails Obama over Libya,” CNN Political Tracker, April 16, 2011, http://politicalticker.blogs.cnn.com/2011/04/16/bachmann-assails-obama-over-libya/. David Edwards, “Bachmann claims NATO killed 30,000 civilians in Libya,” The Raw Story, May 1, 2011,http://www.rawstory.com/rs/2011/05/01/bachmann-claims-nato-killed-30000-civilians-in-libya/. Sam Stein, “Michele Bachmann Channels McCarthy: Obama ‘Very Anti-American,’ Congressional Witch Hunt Needed,” Huffington Post, October 17, 2008, http://www.huffingtonpost.com/2008/10/17/gop-rep-channels-mccarthy_n_135735.html. Washington Post, “Michele Bachmann offers Tea Party response to President Obama’s State of the Union Address,” January 26, 2011,http://www.washingtonpost.com/wp-dyn/content/article/2011/01/26/AR2011012603412.html. William & Mary Law School: LL.M.